Q: How can I use some of the pictures and icons that are used by the Home Server Console? A: Rather than violating the EULA and ripping the images you want straight from the files that came with Windows Home Server (which is certainly possible)... you can look to the CommonImages class (Microsoft.HomeServer.Common.Client, WHSCommon.dll) and it's 71 public static properties (69 of which return something), each of which returns different icon or image that can help you better theme your add-in. One unfortunate limitation of CommonImages is that some of the more sought after icons like those used for add, delete, edit and properties are not present... however a green check and red x are. You could randomly guess which is which... or you can use one of these two applications (C# or VB) which displays them. With any luck, eventually Microsoft will make available (either officially or unofficially) more of the art used in the Home Server Console so that developers can better integrate visually with it. Some say that that the majority of developers are psychologically incapable of adequately testing their own code (outside of unit testing) because subconsciously they know where their program works and where it doesn't and will avoid straying from the path so that their program keeps working great. I admit it... I'm one of those developers. Right now I'm having the fun of forcing myself down random paths to test strange edge cases for my new Windows Home Server add-in... cases that it would be more than fair for me to just say say "Sorry, but you did something I told you not to do and now this add-in cannot clean up after itself"... but I'm not. Technically everything I am doing is unsupported by Microsoft as I'm using a number of Windows subsystems that shouldn't ordinarily be used by a Windows Home Server user... in fact normal use of them could even violate the end user license agreement. What I'm trying to do this evening is do my best to make sure that even if a user enables DFS and dinks around with that or other such systems, I'm able to gracefully handle dang near anything the user might have done. Once I've got those edge cases accounted for... I need to improve my logging and I'll be all set. Q: Is there an easier way to get started in building my add-in other than building it from scratch... like a project template? A: There are no official project templates and to fill this gap back in April (now) WHS MVP Ken Warren did release a couple example templates that I've used for every single add-in and test add-in I've written. Looking for another language? Managed C++? J#? Feel free to ask. Where <Language> is either Visual C# or Visual Basic. Launch Visual Studio 2005**, bring up the New Project dialog and select the language of your choice. Under the My Templates section you will see a template named Home Server Add-In (apologies for the poor icons*), select it, type in a name for your project and press the OK button. The created project will contain 2 different kinds of files, user controls and the required Home Server classes. Two classes named HomeServerTabExtender and HomeServerSettingsExtender do the work of informing the Home Server Console what controls exist in your add-in, what their display name should be and other settings. With the exception of changing the display text and icon, you can largely leave these classes alone. There are also two user controls named MainTabUserControl and SettingsTabUserControl which are the place for you to add your custom layout and code with the ease of the Visual Studio Forms Designer. Unless you've specially rigged your development environment (which I'll cover in a later Dev Tip), you'll need to manually add a reference to HomeServerExt.dll (located in C:\Program Files\Windows Home Server\ on your Home Server). Where YourTabName is the unique name you've given to your tab. In order to make your tab meet these requirements, you will need to edit your project's properties and change the assembly name to meet the above criteria. As easy as it is to make an add-in with these templates, a bug exists in Visual Studio 2005 and 2008 which allows the dynamic naming of the namespace based on the project name you specify... however the assembly name is always set to the project name, something that isn't always desired. To use your new add-in, simply copy it to the C:\Program Files\Windows Home Server\ directory on your Home Server and re-start the Home Server Console. You can also make your own installer using WiX or Visual Studio Setup Project to install your add-in through the Home Server Console. *If any readers have any suggestions as to how these templates could be improved, or want to make a better looking icon for the templates, please let me know. **These templates have also been tested with the the beta 2 version of Visual Studio 2008 and to make them visible, change the directories mentioned previously appropriately (2005 -> 2008). To install remote access for Q Home Server follow these steps. Setup your router to forward ports 80 and 4125 to the Q Server. While it's clear that this file pre-dates the initial beta of Windows Home Server and probably should have been removed sometime between then and now, one has to wonder just how old it's instructions may be and for how long they were relevant (ie using dsa.msc to create a user). While the presence of this file isn't by itself important, it does go a long way to remind us though just how far WHS has come and how polished it has become, that now even for setup a user never has to touch the actual home server desktop. As part of his eternal studenthood (with the current phase occurring at UNL), Dan over at tdaxp has put out a call for participants for a 30 minute survey that focuses on Creativity and Blogging. Then stop on by and take the survey. Off and on for the last couple of days I've been playing around with making Visual Studio project templates and customizing them with Template Parameters and ran into a little issue... the assembly name template being specified in the larger template is simply ignored. What does that mean? If I create a custom template with the AssemblyName tag being specified as say... Xyz.$safeprojectname$, and create a project named "My Test Project" based on it... the resulting assembly name is "My Test Project", not Xyz.My_Test_Project as that syntax would generate for a namespace... even on a fully patched copy of Visual Studio 2005. From the looks of it this has been bugged before on Connect... but ultimately closed as not reproducible. Thinking I can show how to reproduce it.. I've submitted it myself: Custom AssemblyName tag ignored in template. 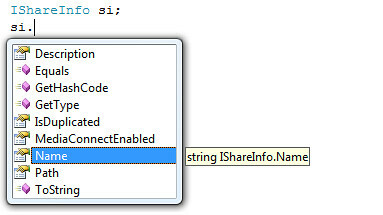 There still exists a problem... the same issue exists in at least Beta 2 of Visual Studio 2008. Someone first pointed it out in April 07 as existing in the March CTP, and in my testing it seems that this still exists... so it to has been bugged. Double Grrr I suppose when it sounds like Beta 2 will be the last publicly available version of Visual Studio 2008 before they RTM so there will be no way for me to know if this bug has/will be fixed by then. Q: How can I make Visual Studio provide more useful Intellisense support for the Windows Home Server SDK? A: In order to get Intellisense support in Visual Studio a developer needs an xml file that contains all of the xml comments from the original code, something that was likely used to create the documentation available on MSDN today... unfortunately no such xml files have been made available for Windows Home Server from Microsoft, instead developers are forced to go without or make them themselves. Based on the documentation on MSDN, I have created a pair of xml documentation files for both HomeServerExt.dll and Microsoft.HomeServer.SDK.Interop.v1.dll which are available for download here. Once extracted, you need only add a reference to one (or both) of these assemblies (that sits next to the associated xml file) in Visual Studio and the documentation will be there for you. Note that if you want to use this documentation in an existing project, you will first need to delete the references and then re-add them. Note: These files have been tested in Visual Studio 2005 and 2008 Beta 2 in both VB and C#. Major (and a month late) congratulations goes to Andrew Grant (no relation) and his add-in Whiist, David Wright and his Jungle Disk and Prakash Gautam with Community Feeds for Windows Home Server for winning the Microsoft Windows Home Server Code2Fame Challenge. It's truly wonderful to see so many great add-ins being created for this new platform and look forward to seeing in the coming months what ideas couldn't make it in to the competition. On the plus side it looks like my entry did receive an honorable mention (scroll to the bottom). 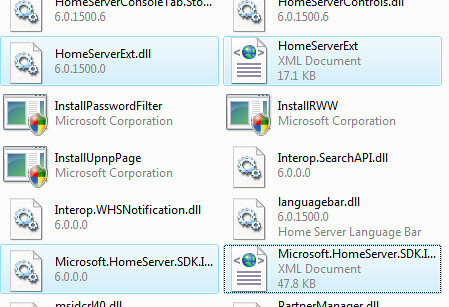 Q: How can I make a more WHS style Message Box like what the Home Server Console uses? One of the first things a programmer testing out QMessageBox will notice is that the dialog is far larger than a regular MessageBox and is formatted to look more WHS like in terms of icons and color and is probably the biggest reason to consider using it (over making ones own dialog from scratch). 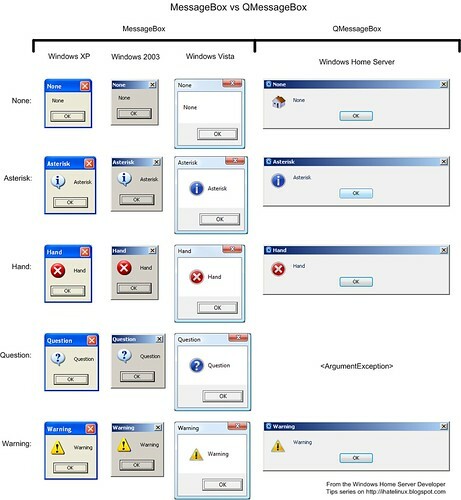 Keeping the future in mind, the developer(s) behind QMessageBox actually changes its appearance in another key way by replacing the default system icons (as based on the MessageBoxIcon enumeration) with those that ship today with Windows Vista instead of the ones that would ordinarily be displayed by Windows Server 2003. An unfortunate limitation of QMessageBox is that internally something is wrong with it's handling of the MessageBoxIcon.Question value because use of it will raise an ArgumentException, so be sure to stick with one of the other 4 working values (None, Asterisk, Hand, Question & Warning). A major pet peeve of mine about MessageBox was that it only had two text areas that you could use, the text argument displayed in the body of the window while the caption argument was displayed in the title bar. 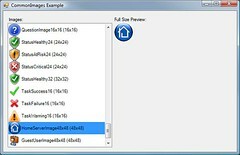 For any more advanced formatting you had to make your own dialog or add new line characters to separate certain areas... QMessageBox takes this idea and extends it by allowing a third argument named title which appears as a bold area of text that appears above where the text is.